UPDATE: The first cohort of diaries is online! 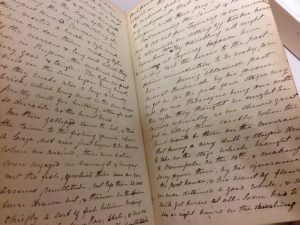 The PACSCL Diaries Project brings researchers an intimate view into a wide varieties of personalities, largely from Philadelphia, as they went about their daily lives and commented on the world around them. 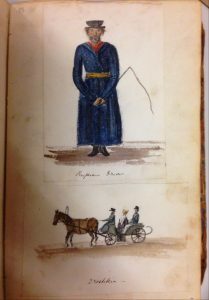 Mrs. Daws travel diary (Kislak)The project will provide an online archive of approximately 100 diaries drawn from PACSCL member collections. Member libraries with robust digital capabilities are partnering with the institutions lacking such facilities to digitize those members’ diaries at no charge as their workflows permit. The diaries will be presented as free cultural works as 600 dpi tiffs plus smaller jpgs and thumbnails, with associated metadata (encoded in TEI 5) with a very simple initial interface. Users will be able to download and repurpose the content. As one example of reuse: users will be able to view the diaries online using a page-turning interface based on the Internet Archive’s software, on display at the project website, diaries.pacscl.org. The images and metadata are hosted on the University of Pennsylvania Libraries’ OPenn site to view content already present on the site, including the first cohort of 53 diaries). The project offers a number of benefits to PACSCL and to its member institutions. It exposes significant collections at relatively low cost. It demonstrates and encourages PACSCL institutions’ commitment to open access. It serves as a testbed for the exploration of issues of digitization standards, metadata, and ways of working together. It encourages adaptive reuse of primary sources. It provides a pathway for PACSCL members with less robust digital infrastructure to expose collections. And, finally, it demonstrates PACSCL’s intrinsic value by showing the will of its institutions to work together in the absence of external funding. Among the PACSCL institutions, there are three broad categories of digital capability: those that may serve as “digital donors” and provide digitization assistance for other members; those who are able to digitize and contribute their own materials but are unable to provide assistance to others; and those who lack a digital capacity. (It is expected that all participants, however, will produce their own metadata.) Participants will provide the image files and and metadata spreadsheets to Penn on an external hard drive. Although this project does not solve the problem of long-term preservation, it does provide some redundancy in that the digital assets will be stored at Penn as well as the individual institutions. Mrs. Daws travel diary (Kislak)The project is being conducted on a phased basis. Phase I has tested and revised project components and workflow. Participants include those institutions whose diaries are already digitized. This phase also includes a small number of diaries from institutions without a robust digital capability, which are being scanned by the Schoenberg Center for Electronic Text & Image at Penn at no cost to the institutions. Participants attended a metadata “boot camp”-style workshop conducted at Penn in late March. Other PACSCL institutions will contribute imaging resources in later phases. Finally, the project team will consider a more robust and scalable interface than the current WordPress installation. Project documentation is shown in the attached files. PACSCL members wishing to participate in the project may want to review the project documentation below. Members should contact Laura Blanchard (lblanchard@pacscl.org) for information on the project and Holly Mengel (hmengel@pobox.upenn.edu) for help with metadata.